ST. PETERSBURG, Fla. and PHOENIX -- Minor League Baseball™ (MiLB™), in collaboration with the Derrick Hall Pro-State Foundation, has renewed its commitment to educate fans about prostate health this Father's Day weekend. In its third year, the effort is coordinated by Minor League Baseball Charities, a 501(c)(3) not-for-profit organization dedicated to giving back to and enhancing the communities MiLB teams call home, and the Arizona Diamondbacks. All 69 individual clubs at home on Sunday, June 17, will distribute prostate cancer awareness literature, including customized brochures, and branded giveaways to fans. Teams will feature a personalized public service announcement from Arizona Diamondbacks President & CEO Derrick Hall, a prostate cancer survivor, and incorporate other prostate cancer informational messaging into their gameday programming. In addition, each team will recognize an outstanding father in its local community or someone who is battling or has survived prostate cancer. The individual will be presented with an engraved full-size Louisville Slugger Father's Day commemorative bat at the game, courtesy of the Derrick Hall Pro-State Foundation. Fans are encouraged to use #MiLBGoPro on social media to help spread awareness and join the ongoing outreach efforts. The Derrick Hall Pro-State Foundation, a certified 501(c)(3) organization, was founded in January 2013 by Derrick Hall as a comprehensive tool for those who have been diagnosed with prostate cancer and their families to help them understand the challenges and choices they face. According to the American Cancer Society, nearly one in every six men will be diagnosed with prostate cancer in their lifetime and almost 250,000 new cases are diagnosed each year. It is the second-leading cause of cancer death in American men. "It has been incredible to see so many men become educated about the importance of prostate cancer screening and early detection through this initiative with Minor League Baseball," said Hall, who was diagnosed with prostate cancer in 2011. "Each Father's Day, dads across the country spend time at the ballpark with their families and we want to ensure they continue to do so in good health for years to come. I am extremely appreciative of the efforts of Minor League Baseball in helping save so many lives while encouraging those who have been diagnosed to maintain a pro state of mind." "As we celebrate fatherhood, paternal bonds and the influence of fathers in our lives this Father's Day weekend, it's only fitting that we use this opportunity to also educate fans," added Pat O'Conner, Minor League Baseball President & CEO. 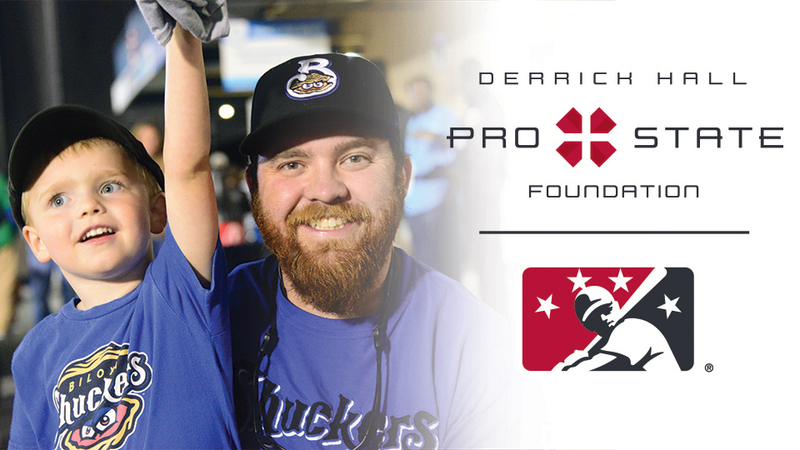 "Minor League Baseball has fully supported the Derrick Hall Pro-State Foundation initiative for several years because we share in its mission to help raise prostate cancer awareness with men and their families so they can live long and healthy lives." For a list of Minor League Baseball games this Father's Day weekend, visit MiLB.com/schedule. To learn more about Minor League Baseball Charities and its Charity Partners Program, visit MiLB.com.